courtesy of Weavers Way Co-opWeavers Way Co-op in Mt. Airy will host its very own Vegan Fest, a “celebration of all things vegan,” on Sunday, March 20 from noon until 4p.m., showcasing vegan products from Bhagya’s Kitchen, Jyoti, Moshe’s, Fresh Tofu and Helen’s Pure Foods. There will also be an assortment of products made by the Weavers Way prepared foods department. Since 1972, Weavers Way Co-op has been a community institution offering locally grown, nutritious and sustainable foods. With over 4,600 members today, Weavers Way has made quite a name for itself over the past few decades. 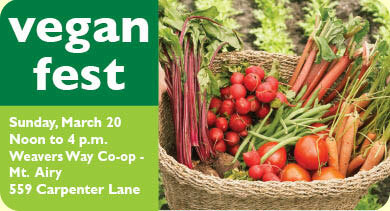 Not only will the co-op's first Vegan Fest educate novice vegans on the health and environmental benefits, it also will ensure that the specified vegan diet is nutritionally complete.